As mentioned in a separate post, a number of new restaurants/food outlets recently opened in Tyson's Galleria. My daughter and I were out doing some Christmas shopping, and we decided to check out Sen Khao. I haven't been to Thip Khao, but I frequented Bangkok Golden a few years ago, which is the restaurant that introduced me to Lao cuisine. The menu is somewhat "compact", and featured two starters, a salad, two sticky rice dishes, and three noodle soups. You have your choice of proteins for the salad dish as well as the soups. We opted for Curry Puffs ($5) and two of the soups. The curry puffs may have been the best I've ever had. The dough was thin, light, and perfectly cooked, while the filling consisted of nicely seasoned pieces of potato. An order consists of two curry puffs with accompaniments. 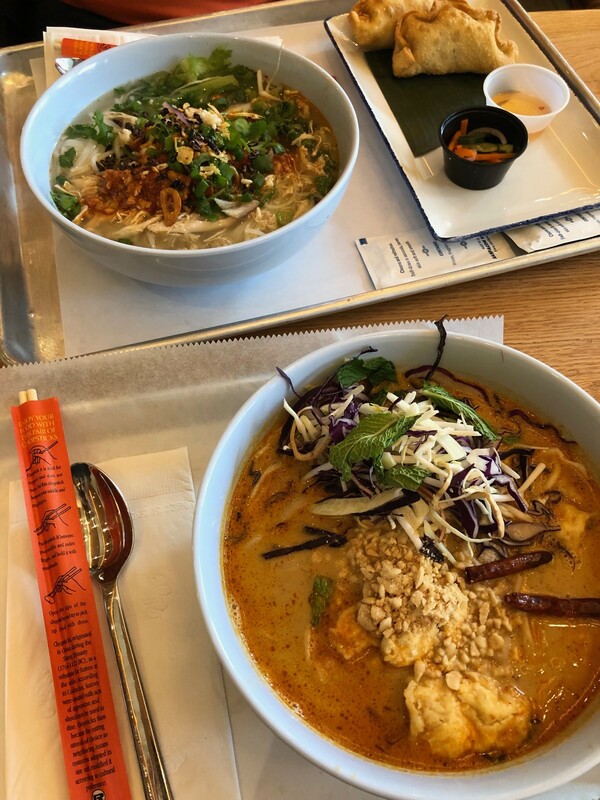 My daughter opted for Mee Kathi with tofu, which is a coconut curry rice noodle based soup flavored with egg, peanuts, cabbage, and banana blossom. She declared her soup to be outstanding as well. The service was extremely quick, and the staff was very friendly and helpful as well. If I worked in the Galleria or lived nearby, Sen Khao would be on my short list. We strolled to check out the other food outlets, and picked up an eggnog ice cream cone ($4) at Ice Cream Jubilee. The eggnog ice cream was fantastic. Creamy, rich, and with a hint of rum. They offer several interesting flavor combinations (Thai Iced Tea, etc.) Looking forward to a return visit there, as well. Yes, that's the Mee Kathi. It was indeed wonderful. I forgot to mentions the portions are quite substantial, as well. I had the Mee Kathi with shrimp. It was I'd-take -my-Lao- Momma, good. My only complaint is that I desired more of that scrumptious broth. I tipped the bowl to my lips. None of that broth was going to waste. Mee Kathi is a favorite of mine at Padaek. I have been here twice now - and am a long time regular at Padaek. I really hope this food court can survive - even the small menu is so satisfying. While it is no longer on the menu, they have had crispy rice salad with tofu (and sour pork if you eat meat) that is so good (I believe it is called naem khao thadaeu and I don't know how I have missed this for so long at Padaek). The chef made it for me last night. The soups are as good as others noted above and are consistent with the high quality of the ones in the regular restaurants. I do too. I was there on a perfectly great Saturday afternoon, & the number of guests was surprisingly low. The offerings are all delicious & reasonably priced , so I wonder what the formula is to stay afloat? We've tried all three soups and the chicken wings with coconut rice. I think the Mee Kathi is our favorite, definitely with the tofu. The chicken wings are spicy but addicting, I only wish they'd come with more pickles. We've been twice and they've hooked us as regulars, especially since our son likes being in the food court so much. At noon on a Sunday I think every table eating Lao food (including us) also had a stroller.